I'm still in awe of moments when I realize something isn't what it seems with Orion. Tonight I was at HEB grocery store at the corner of Oltorf and South Congress with Orion and Anastasia looking for last minute dinner ingredients. I wheeled my lil wizard around the store picking food and putting it anywhere there was space on his "stroller". I put a huge bag of tortilla chips on his lap, Orion proceeded to hug it like it were a teddy bear. Hmm, who needs a teddy bear when you got a fabulous bag of chips. Stroll, pause, pick, stroll. Repeat. In line at the cashier, I reached down to touch the bag of chips, Orion found my arm and brought my hand to the top of the bag. That's his way of asking me to open the bag! It dawned upon me that I didn't take him to the store often because of tough trips in the past. That's going to change anyway due to our local store having its own "Caroline's Cart" now. Anytime he's able to touch a bag of chips or pretzels, it was at HOME! The cool signing cashier dude recognized Orion's intense interest in the bag and handed it right back to me after scanning it. Orion held on to the bag all the way to the van, up into his seat, and... yeah, of course I opened it for him! One day he will sign "open", like I did model it for him tonight but for now, grabbing wrists and hands will do! Clear communication intent happens every day when it comes to food (no surprise!) and anything he can get our hands to touch. 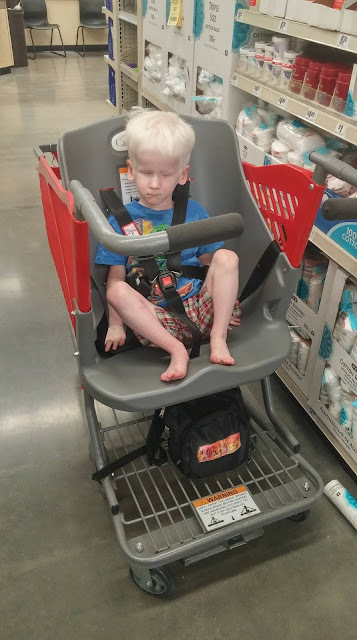 "Orion in the new "Caroline's Cart" at our local HEB grocery store [not the HEB mentioned earlier in this post]. Its a cart made with a seat for kids who need more support than the typical cart kiddie seat. He had a GREAT time, so did I with this newfound ease of shopping. I was stopping and going, making fast u-turns in aisles. He tried to eat a potato while feeling me putting/dropping them in the plastic bag. He WILL know how french fries are made. Fun!" My suave son modeling in the cart.